There were wins for Yuko and Brian and third place for the men’s masters team as 45 Fairlands Valley Spartans hit the Therfield Heath hills in the final race of this season’s cross country season on Sunday morning. ANDREW PATTERSON led in the 23 Spartan men in sixth place and taking 35 minutes 48 seconds for the 5.5 undulating miles. The fastest female from Fairlands was also sixth. NATALIE LAWRENCE’s top ten place in the women’s contest was achieved in 43 minutes 14 seconds. SUZY HAWKINS was next in at 12th with 46:04 and the amazing YUKO GORDON underlined her emphatic league win in the 65 plus category at 14th with 46 minutes 12 seconds. MICHELLE REEVES, 46th in 51:41 and ISABEL GREEN 47th in 51:42 completed the women’s “A” team for Fairlands Valley who were third out of twenty on the day showing what could have been achieved with a bigger turnout in the race at Watford. Women’s teams consist of five runners in the Sunday cross country league and FVS had four complete teams. In the open team race the men’s team of eight included four seniors – Andrew Patterson; MIKE GREEN 77th in 42:49; DANNY SCANLON 92nd in 43:33 and NICK GILL running his first cross country 94th in 43:43. The men’s open team were fourth on the day and fifth in the league. ROS INGRAM led in the women’s “B” team, she was 54th woman in 52:50, which included CLAIRE EMMERSON 55th in 52:51; SOPHIE COWAN 75th in 54:33; SARAH PIKE 81st in 55:51and ANN TRYSSESOONE 91st in 58:05. PENNY SCHENKEL and KELLY McHALE brought in the “Cs” with 58:50 and 60:05. Fairlands Valley Spartans have fourteen runners in this Saturday’s National Cross Country Championships on Parliament Hill Fields. The women’s race is at 2.20p.m. and the men’s at 3p.m. Supporters will be very welcome. This weekend TREVOR and KAREN BROOM went to Llanelli in South Wales. On Saturday Trevor ran the Llanelli coastal park run and got a personal best (PB) of 31.51 on the lovely route along the coastal path. Then on Sunday Karen ran the Llanelli Half Marathon in 2.21.26. She says it was a hard run out from the parc y scarlets rugby stadium along the coastal path and back again along the coast. At the Southern Counties Veterans Athletics Club indoor championships DAVE BOWKER competed in the 3K walk. He was fifth in 19 minutes 13 seconds for the 15 laps of the Lee Valley track. GERRY ROSEN completed the Hampton Court Palace Half Marathon. It was his first half marathon event and he finished with a time of 2 hours 16 minutes, so it’s a PB!! Congratulations to BRIAN WHITE and YUKO GORDON. Brian won the veteran’s achievement prize in the Comet Sports Awards and Yuko was a finalist. A picture by Penny Schenkel of Kelly McHale and Juliet Fullwood at the Relays in the Park was displayed at the event. At Stevenage ROSIE LYON-SMITH ran her first parkrun and was first woman over the line, finishing in 21:12. VERITY FISHER was 12th, and CLAIRE EMMERSON 13th (both in 26:00) and TRACY PEZ was 17th in 26:40. The other highlights at Stevenage were new course PBs for STEVEN DOBNER (28:54) and for HAZEL JONES (36:51). Elsewhere TREVOR BROOM ran a new course PB of 31:51 at Llanelli Coast. Fairlands Valley Spartans Champions Night in Old Stevenage on Friday 23rd February. National Cross Country Championships, Parliament Hill Fields, London on Saturday 24th February. UKA Club Run at Fairlands Valley Spartans on Thursday 1st March. Big London Half Marathon on Sunday 4th March. Milton Keynes 5K, 10K, Half and 20 miles on Sunday 11th March. 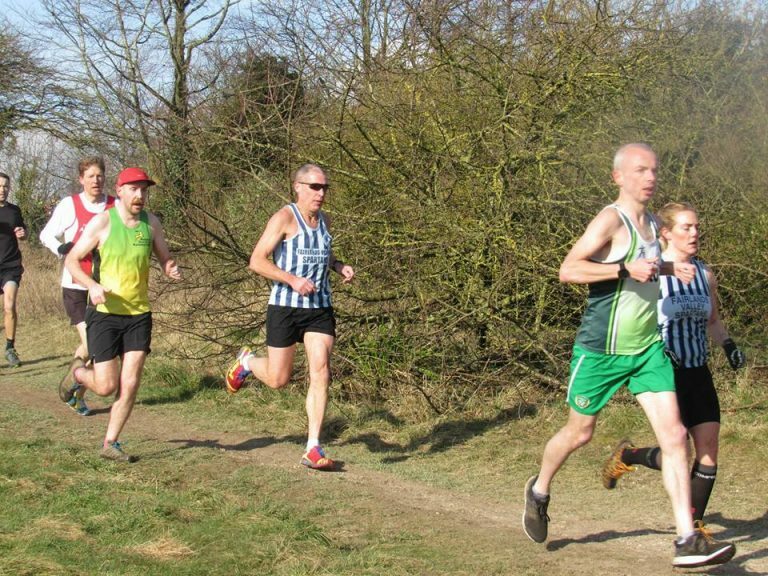 Finchley 20 miles (including Herts County Champs) on Sunday 18th March. Serpentine 5K on Friday 23rd March (please note change of date). EMAC track and field event one at Stevenage on Wednesday 2nd May. County open 1500 and veteran track and field championships on Monday 7th May. Pednor Five including county championships for veterans on Monday 7th May. Mid Week Road Race League race one in Epping Forest on Thursday 10th May at 7.30p.m. Mid Week Road Race League 10K in St. Albans on Thursday 24th May. EMAC track and field event two at Bedford on Wednesday 6th June. EMAC track and field event three at Cambridge on Wednesday 4th July. Fairlands Valley Challenge off road on Sunday 15th July. EMAC track and field event four at Milton Keynes on Wednesday 1st August. St Neots Half Marathon on Sunday 18th November.